Recently, BBR was asked to help create some unique graphics for a new project of Arc of Acadiana: Midtown Jeans & Tees. We’re pretty proud of how it turned out! Arc, a long-time client of BBR, is dedicated to improving the quality of life for people with developmental disabilities by providing opportunities for workforce training, community participation and socialization. Midtown Jeans & Tees is their latest project — the first to specifically target the millennial market. With a location close to the University of Louisiana campus, the store sells gently worn vintage and on-trend clothing pieces at affordable prices. A donation bin is located on-site to make clothing drop-offs easy for local patrons. In order to attract a younger demographic to the thrift shop, Senior Art Director Burt Durand got to work on sketching bright, eye-catching graphics featuring items sold by the store. “I wanted to make something fun and cool to match the campus vibe. The stylized illustrations of people interacting with the clothes work well on all pieces, from window decals to social posts. This isn’t just another thrift store — it should be a great resource for students,” says Durand. The graphics have since been installed on the main storefront windows of Midtown Jeans, as well as featured on billboards and their website. The shop celebrated its Grand Opening on July 7, 2018, and it has already become a hot spot for shoppers who need to dress to impress — without spending an impressive amount. 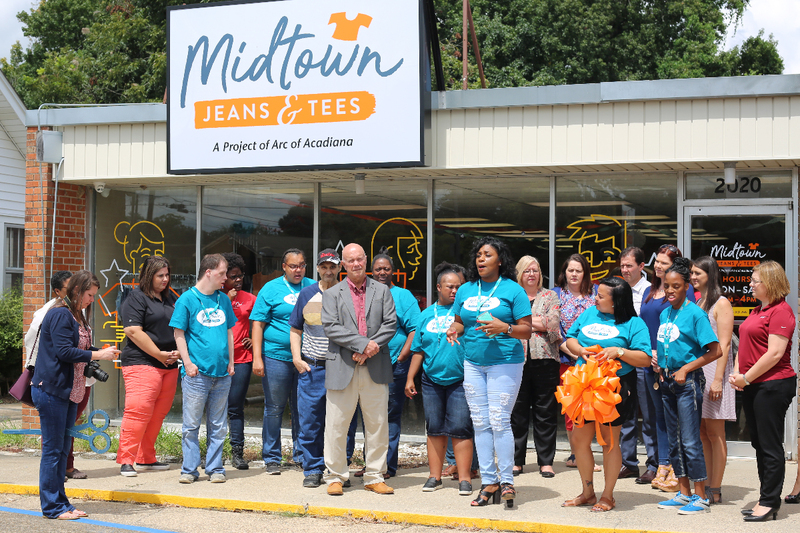 For more information about Midtown Jeans and Tees, visit midtownjeans.com, or pop into the shop at 2020 Johnston Street!